Use Canva’s amazing collection of templates to create a media kit quickly and easily. Editors and reporters get numerous press releases and media kits on a daily basis. Make sure that you get their attention and interest with a media kit that’s not only useful and informative, but also perfectly designed. With Canva’s collection of professionally created templates and intuitive design tools, you can create a media kit that’s fully customized and branded to perfection. With a little creativity and some help from Canva, you can secure those precious write-ups, interviews and publication space in no time. Create a new Canva account to get started with your own Media Kit design. Whether you’re already a Fortune 500 company or a small business with a big idea that’s just taking off, having a media kit will ensure that you will be able to provide ready information about your company, brand, services and/or products. The purpose of a media kit is to attract the press’ attention and gain you leverage for securing space in their publications or shows. So, make sure that you show off the best side of your brand by handing out a professional quality one. Canva’s collection of media kit templates were created by our amazing team of graphic designers to fit a myriad of industries. Whatever industry you fit into, it’s a simple matter of taking one of these amazing templates and editing design elements until your design fits exactly what you need. Make sure that your media kit is properly branded by adding your company logo and color palette. To include your logo, simply upload a JPEG, PNG or SVG version from your computer and into Canva. Drag and drop it into your workspace and resize or move it around as needed. You can further brand your design by tweaking it to reflect your brand palette. Click on the color selector on the toolbar and choose from the full spectrum of the color wheel. Or, input your brand’s hex codes into the box. 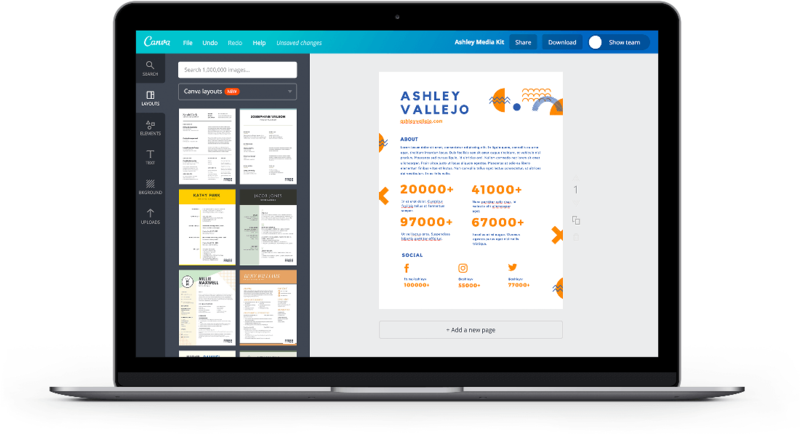 Canva for Work users have the ability to create a Brand Kit which stores their brand assets like logo, fonts and palette into their team folder, ready to be applied across all designs. Add some visuals to support your press release, company backgrounder or articles. Canva hosts an amazing media library of over a million high quality stock images, illustrations and icons. There are plenty of free images in the library and premium elements only cost $1 for each one-time use. Browse through a wide collection of categories and industries and just drag and drop your chosen images into your design. Canva is available on the web as well as on iOS and Android devices. Simply head on over to www.canva.com to start creating your design. You don’t need to download Canva, just create an account and log in. How can I format the text for my Media Kit? You can edit your text in a variety of ways to make sure it fits your design needs. Using the text tools, you can change the font type, size, color, emphasis, alignment, spacing and transparency. You can also turn your text into a bulleted or numbered list. Make sure your Media Kit is easily recognizable and properly branded by uploading your logo, using your brand color palette and consistent fonts. To upload your logo, click on the Uploads tab in your object panel, select the Uploads folder, and click on the green Upload your own images button. Select any PNG, JPEG or SVG file you wish to upload from your computer.